Acer has announced an entirely new addition to their AIO desktop PC line-up today and it's the company's thinnest, sleekest option yet. Dubbed the Acer Aspire S24, the AIO machine comes in at a mere 0.235 inches in screen thickness with ultra-thin "champagne-gold" bezels. 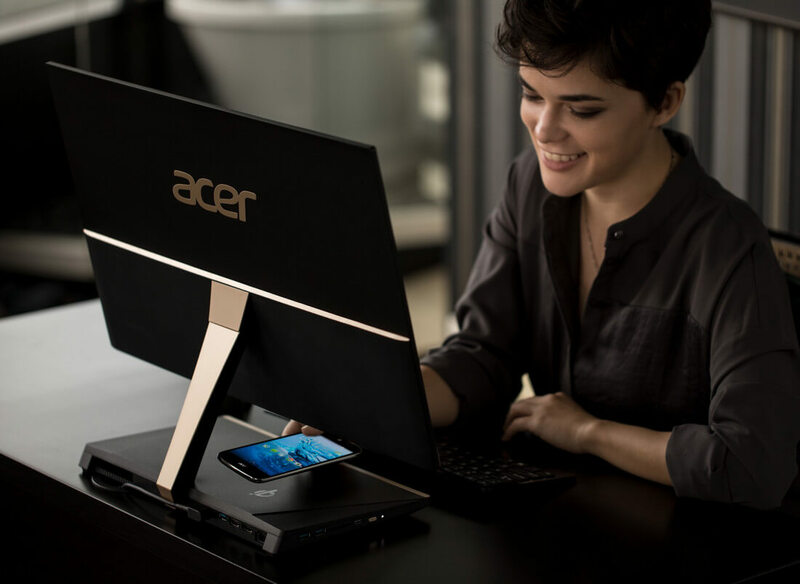 Acer feels their S24 stands out for more than its aesthetic, though. The device also boasts a 24", 1920x1080p IPS display with "accurate colors up to 178-degrees." Acer has also integrated a wireless device charger into the S24's base, allowing you to charge your smartphone or any other Qi-enabled device without the need to take up an extra USB slot on the machine itself. "We think customers in the United States will be delighted with the elegant aesthetics and convenient feature set of our newest all-in-one desktop," said Acer's American senior director of stationary products Frank Chang. "The ultra-slim form factor and wireless charging free up desk space, while ample power delivers smooth performance." Speaking of connectivity, the S24 contains a single USB 3.1 Gen-1 Type-C port, three standard USB 3.1 Gen-1 ports and a lone USB 2.0 port. If one display isn't enough, Acer also says the S24 will contain an HDMI slot for a second monitor, though the company made no mention of other display connectivity options such as DisplayPort or DVI-D.
As is often the case with AIOs, the S24's unique design does come at the cost of performance. While far from the weakest AIO on the market, the S24 does not contain a dedicated video card, leaving graphics processing tasks to the integrated Intel UHD 620 present within the device's 8th-gen Intel i5 8250U processor. The S24 contains 12GB of DDR4 RAM clocked at 2400MHz by default (with support for up to 32GB RAM) and a 1TB HDD for your storage needs. Acer has not specified the hard drive's speed anywhere on the S24's store page, so we've reached out to the company for clarification. Update: An Acer spokesperson has confirmed the HDD runs at 5400RPM. If the Windows 10 Home-powered Acer Aspire S24 sounds like your type of device, US residents can pick one up right now directly from Acer for $899.